P.-T. KREIN, "Element of power electronics", Oxford University Press, 1997. 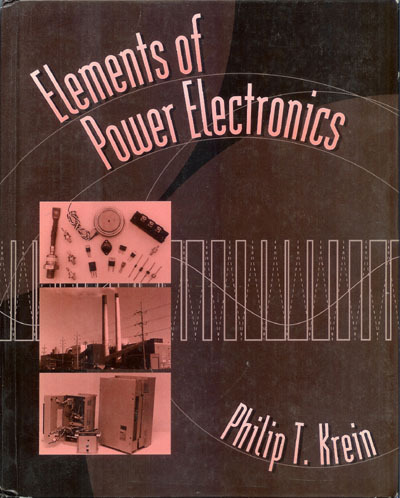 Titre : P.-T. KREIN, Element of power electronics, Oxford University Press, 1997. Cité dans : [DIV094]  Recherche sur l'auteur Philip T. KREIN, juillet 2007. Lien : KreinPhi.jpg - image, 6 Ko. A Web site, http://power.ece.uiuc.edu/krein_text is maintained for the textbook. A Solutions Manual is available through the World Wide Web to registered faculty members. Info : Page numbers are from the final manuscript, and differ from the printed textbook. Référence : H.D. Brown, J.J. Smith, "Current and voltage wave shape of mercury arc rectifiers", Trans. AIEE, vol 52, p 973, 1933. Lien : MTP50N05E.pdf - 6 pages, 230 Ko - MTP50N05E, TMOS E-FET Power Field Effect Transistor, 50A 50V, RDSon = 0.028 OHM. Lien : MTP50N06EL.pdf - 8 pages, 233 Ko. Lien : MBR3045.pdf - 4 pages, 86 Ko, MBR3045PT, Switchmode(tm) Power Rectifier, Schottky, 2x15 A, 45 V.
Example 14.2.6 : commande par transformateur d'impulsions, à faire en TD. ac redulator applications, 271-273, 296.
gate drive issues, 548-549, 566-567. SCR rectifier analysis, 182 192, 339.